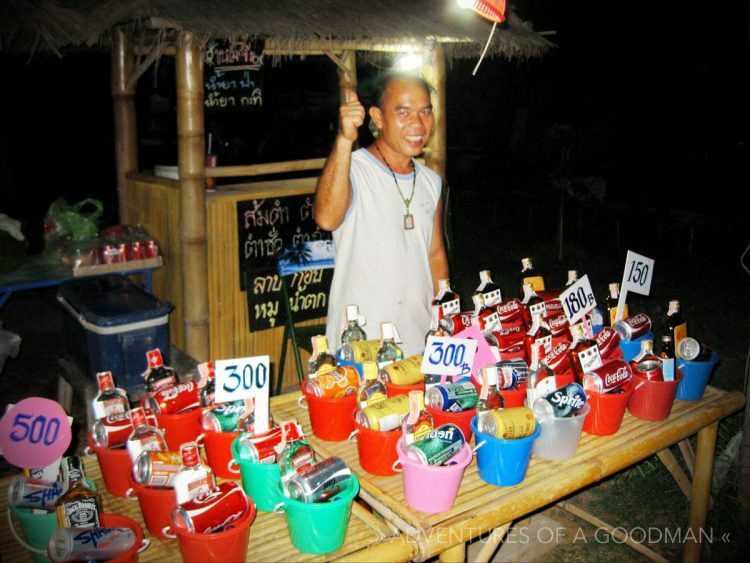 The World's Biggest & Best Party » Thailand's Full Moon Party! Imagine a beach with a few hundred feet between the water and a row of bars roughly a quarter mile long. Each bar is blasting music at concert volumes and selling buckets full of alcohol to anyone regardless of age or level of intoxication. Add some blacklights, body painting, glow in the dark items, food stalls and stages for people to dance on. Now put 10,000 people on the beach and see what happens. While many revelers arrive on the day of the Full Moon Party, we got to Koh Phangan a day early so we would have time to check it all out before the madness began. After waking up in the late afternoon on our first day we wandered around and saw everyone setting up. That evening we attended a pool party next door to our hotel that was filled with a combination of people having a great time horsing around in the pool and others dancing on the dance floor. It was a wild scene unlike anything I’ve seen before, but as we were not in bathing suits or dancing, it was time to check out the beach. Even though it was a warm-up night, there were still a few thousand people dancing away on the beach. The music was great, though it was a bit hard to hear at times as the bars are all right next to each other and the different songs mix together. As for the selection it was mostly trance, techno and an occasional hip hop song. Over the course of the night our group was both together and separated, but every time we saw each other it was like finding a long lost friend in the crowd. At around 5am a flaming jump rope came out and we had a blast watching the drunks try and play. Carrie and I spent the night and early morning dancing our hearts out until the sun came up over the ocean behind us and they shut the music off. By the time we finally made it home it was past 7am. Quite the warm-up. My wife, Carrie, and our friend, Karen, were still dancing at 4:27am when the sun began to rise. We left the beach at 6:18am… quite the warmup! While we all slept until 5pm the island underwent a transformation. People arrived in packs, every local was out selling something and the island felt positively electric. 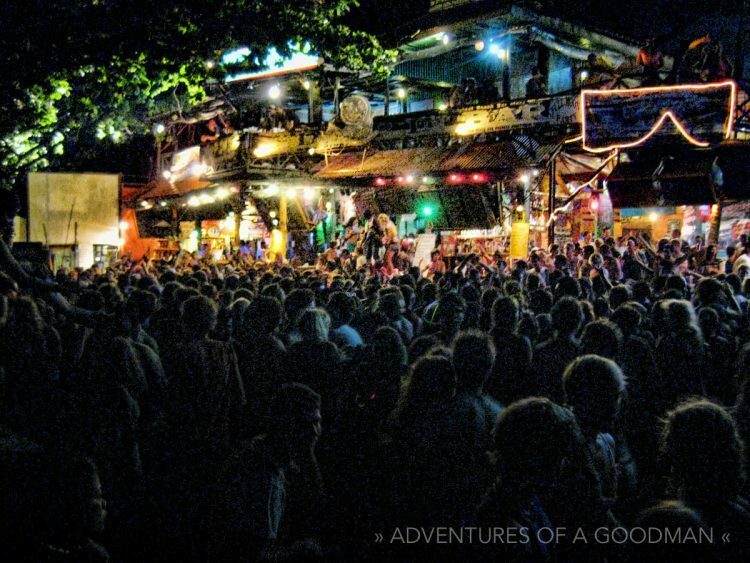 Tonight there was no pool party, no other activities…just the beach and the Full Moon Party. The sky was clear, the moon full, the music blasting and we were ready to go! Let’s party like it’s a full moon! Upon arriving at the beach the first thing we noticed was a huge police presence that was lacking the night before. There was also a “sleep area” where people who had a little too much fun could go and be kept safe by the on-site medical staff. It was good to see that precautions were being taken, as we had heard horror stories about full moon parties in the past. For those not needing police or medical attention, there were rows of stalls with blacklight body paint at the Full Moon Party. My wife, Carrie, modeling her new glow-in-the-dark tattoo. Each one had pretty much the same designs, which they would paint on you for a price. The beach was also filled with people selling glow in the dark bracelets, hats, glasses and necklaces. Pretty much everyone on the beach had some sort of neon aspect to them. Mine was a bright green neon stick around my wrist. Food stalls were set up all over the beach and taxi speedboats were waiting to take people to private parties on yachts anchored just off shore. Countless people were out in the water swimming, sitting, standing or laying down in one of the boats foolish enough to park there for the night. Pretty much everyone had a bucket of booze. A bucket usually has a fifth of some cheap and nasty booze along with a can of soda, handful of ice and straws. Pretty much the entire beach was filled with people dancing, talking, walking around, flirting and having a great time. There were fire dancers, people blowing fire, guys and girls spinning fire and, of course, more fire jump rope. When sunrise finally came, there were tons more people on the beach than the day before. The music also never stopped. While we went back to the room around 7:30am, we met people who were dancing until nearly 3pm. Crazy! So, is it the greatest, biggest and best party in the world? That’s what they say and I do see some merit in the statement. The beach layout is great and gives people a large area to do things without having everything too spread out. Even with 10,000 people there is still room to move around. At the same time, the closeness of the bars gets a bit old when the music mixes together. Also, if dancing the night away isn’t your thing then this is not the place to be. I feel like the best party in the world would have more options. 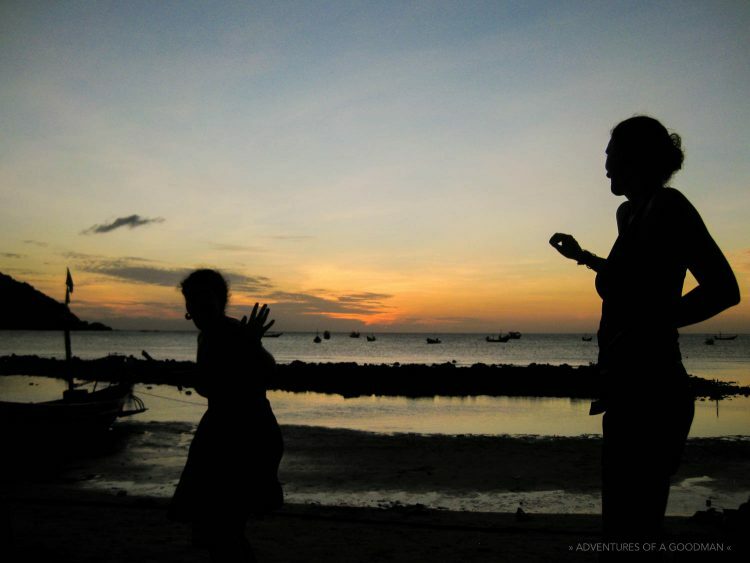 Our dear Claire would show up several more times during our six month adventure in Southeast Asia. What is your favorite party or event in the world?